Beautiful 1957 Chevrolet Bel Air convertible- this car had a complete, professional frame-off restoration in 2016. Restoration included a new 330 Hp., 350 cu in. engine with a rebuilt 200R4 overdrive transmission, and a Ford 9" differential with 3.25 gears. The car also has power steering and power brakes. Front are disc brakes with 2" drop spindles. Basically everything on this car is new or refurbished. That includes a new gas tank and sender, heater core, MSD distributor & coil, Dakota gauges, IDIDIT steering column, four core aluminum radiator, and all new smoke tinted glass. Too much to list- give us a call for more details. 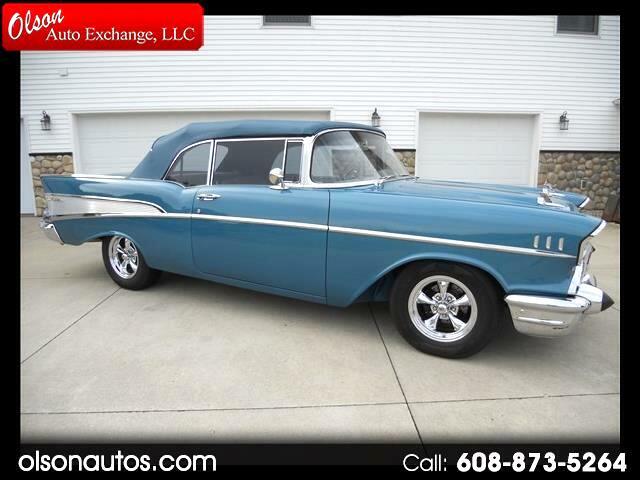 This is a beautiful car that needs nothing and is ready to go cruising and showing today!